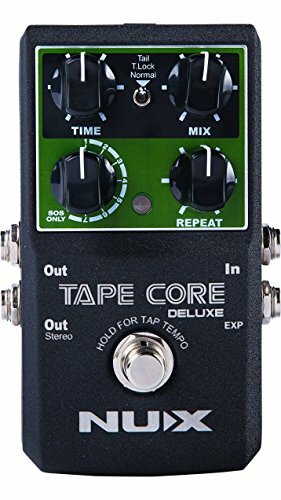 The Tape Core pedal! It s a tribute for the legendary tape echo with a constrict size Crystal clear, incredible ambient!. Tape Core is a compact stomp box that offers classic tape echo tone. Just like the real tape echo, Tape Core has 3 repro heads provided 7 different combinations of delay sounds. All the natural sound, decay, modulation are created by NUX TS/AC Technology, is convenient, professional and inspiring! Simulates analog tape machines in a small package,You can save one preset and choose to have trails or not. 7 modes that combine 3 virtual tape heads giving you different rhythms. 8th mode on the Tape Core which is Sound on sound. Hold down the foot switch on the Tape Core and you enter tap tempo mode. USB port allows to update the effects. If you have any questions about this product by Cherub, contact us by completing and submitting the form below. If you are looking for a specif part number, please include it with your message.